Tech giant Samsung is all set to launch the Galaxy Note 9 in less than a week from now. The device, as is generally the case with the Note lineup, is a regular feature of the rumor mill. Samsung’s got a lot riding on the Galaxy Note 9 as it’s Galaxy S9 lineup has performed quite poorly in the market in terms of sales. Right now, we’ve got a fair idea of what to expect from the Galaxy Note 9, and if you’re hoping for any major aesthetic or external changes, then don’t. Samsung will keep the Note 9’s form similar to its predecessor and only change the fingerprint sensor’s location on the device. Apart from this, the only aesthetic changes are new color variants for the gadget. Today, we’ve got a major leak for the Samsung Galaxy Note 9. Take a look below for more details. While Samsung will not change the Note 9 externally, the Korean tech giant will ensure that its specifications are worthy of a phablet and cater to high-powered users. One upgrade that’s mentioned by a lot of sources is for the Galaxy Note 9’s battery. Rumors and reports suggest that the gadget will feature a 4000mAh power pack. 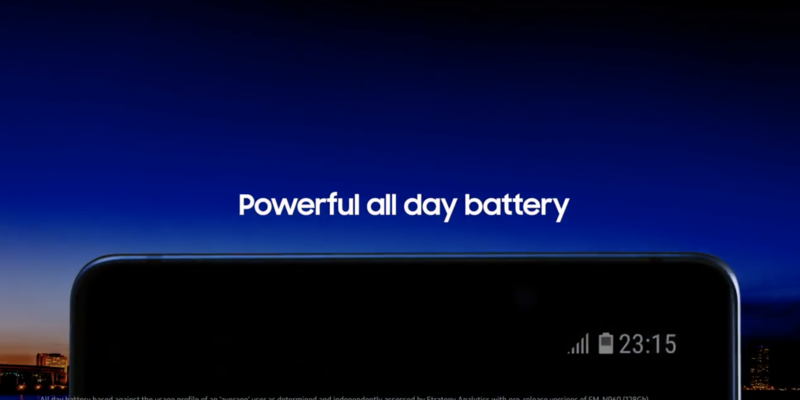 Today’s video, which is most likely an advertisement for the Note 9 also mentions a ”Powerfull all-day battery”. This can rightly be taken to mean that the device will indeed feature a 4000mAh power pack. Additionally, the clip also mentions the gadget’s S-Pen, one feature that has consistently leaked over the past couple of months. It’s expected that the Note 9’s S-Pen will double down as a remote controller for it, allowing users to manage volume settings and camera timer among other functions. It will also feature a laser pointer, enabling business-oriented users to conduct presentations easily. It’s this attention to detail with the small features that will ensure Samsung’s brand name remains dominant and unchallenged. It’s the storage features for the Samsung Galaxy Note 9 in today’s clip that have caught our attention. It’s widely rumored that the phablet will feature 512GB of internal storage but prior to today’s leak, it was believed that this might only be available to Korean users. However, if you take a close look at the video, at the bottom of Samsung’s 1TB storage promise is a caution that 512GB memory cards might not be available in every country. Do we take this to mean that the 512GB variant of the phablet will be available internationally? 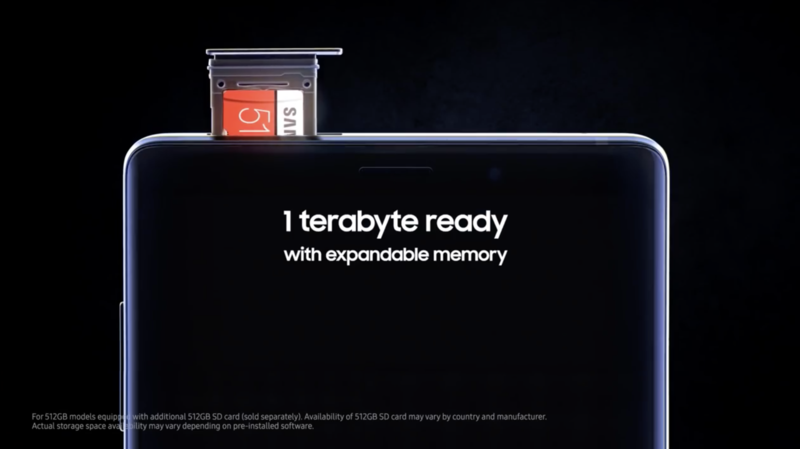 Talking about promises, the clip also suggests that the Note 9 will support up to 512GB of MicroSD storage, hence providing users with an astounding 1TB of storage capacity. The 512GB support is also found on the Note 8, so no surprises there. However, Samsung’s promise of a 512GB variant will definitely attract a lot of users that’s for sure. The Korean tech giant is big and slow but looks like it’s ready to provide users with the specifications that truly matter. If Samsung can deliver all-around performance with the Galaxy Note 9 and mitigate the Note 8’s problems (such as freezing, fingerprint sensor problems, interface lagging), then we’ll have a very solid gadget on our hands. Now, how about that 8GB of RAM as well. . .